Unlike many other computer languages, Java provides built-in support for multithreading. Multithreading in Java contains two or more parts that can run concurrently. A Java thread is actually a lightweight process. This article will introduce you to all the Java Thread concepts many people find tricky or difficult to understand. What is a Java Thread? How to Create a Java Thread? These are time-consuming functions. In a single-threaded runtime environment, these actions execute one after another. The next action can happen only when the previous one has finished. If a historical analysis takes half an hour, and the user selects to perform a download and check afterward, the warning may come too late to buy or sell stock. This is the sort of application that cries out for multithreading. Ideally, the download should happen in the background (that is, in another thread). That way, other processes could happen at the same time so that, for example, a warning could be communicated instantly. All the while, the user is interacting with other parts of the application. The analysis, too, could happen in a separate thread, so the user can work with the rest of the application while the results are being calculated. This is where a Java thread helps. A thread is actually a lightweight process. Unlike many other computer languages, Java provides built-in support for multithreaded programming. A multithreaded program contains two or more parts that can run concurrently. Each part of such a program is called a thread and each thread defines a separate path of the execution. Thus, multithreading is a specialized form of multitasking. 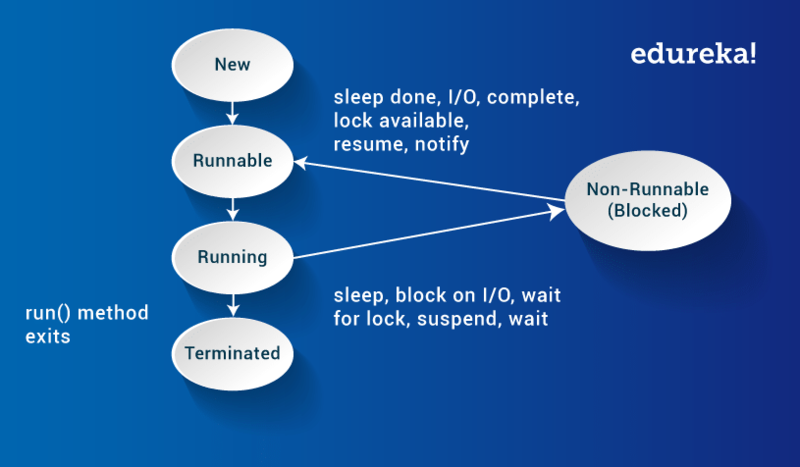 The Java run-time system depends on threads for many things. Threads reduce inefficiency by preventing the waste of CPU cycles. New - When we create an instance of Thread class, a thread is in a new state. Running - The Java thread is in running state. Suspended - A running thread can be suspended, which temporarily suspends its activity. A suspended thread can then be resumed, allowing it to pick up where it left off. Blocked - A Java thread can be blocked when waiting for a resource. Terminated - A thread can be terminated, which halts its execution immediately at any given time. Once a thread is terminated, it cannot be resumed. Now let's jump to the most important topic of Java threads: thread class and runnable interface. Java's multithreading system is built upon the Thread class, its methods, and its companion interface, Runnable. To create a new thread, your program will either extend Thread or implement the Runnableinterface. Now let's see how to use a Thread that begins with the main java thread that all Java programs have. Here, I'll show you how to use Thread and Runnable interface to create and manage threads, beginning with the main java thread. Why Is Main Thread So Important? Because it affects the other 'child' threads. Because it performs various shutdown actions. Because it's created automatically when your program is started. Let's look at how both ways help in implementing the Java thread. When the thread is started it will call the run() method of the MyClass instance instead of executing its own run() method. The above example would print out the text "MyClass running ". When the run() method executes it will print out the text " MyClass running ". So far, we have been using only two threads: the main thread and one child thread. However, our program can affect as many threads as it needs. Let's see how we can create multiple threads. This is how multithreading in Java works. I hope this was informative and helpful to you. In the next entry of my Java Tutorial Blog Series, you will learn about Java Collections. You can also learn Java through our YouTube Java Tutorial playlist. Happy Learning!